If doing business outside Canada you may be required to pay tax on the income earned. In order to lessen, or possibly get rid of this altogether, you will need to apply for a Certificate of Residency to use in any country with which Canada has a tax treaty. To see more information about how to apply for a certificate of residency visit the Canada Revenue Agency (CRA) information page. 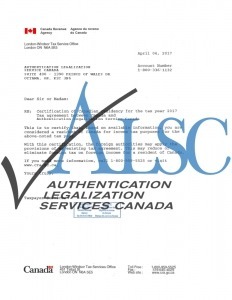 Once you have obtained your certificate, as noted by the CRA, it may require notarizing which we are able to assist you with. In addition in order for you to use the Certificate of Residency outside Canada it will require authentication and legalization the equivalent to an Apostille Certificate depending on which country you will be using it in. Global Affairs Canada will authenticate a CRA Certificate of Residency once it has been notarized but they take 25 business days if dealing with them by mail or courier. This is where our authentication services can offer you quicker service of 1, 3 or 10 business days see more about them here. In order for the Certificate of Residency to be accepted in country after it has been authenticated it must be legalized. This step must be completed in order for it to be the equivalent of an Apostille as required by the countries who have signed the Hague Apostille agreement. Before the embassy will accept the Certificate of residency for legalization they require fees and other documents but not to worry our consultation will guarantee you are prepared.